Simple teal blue stained glass pendant shipped to Maryland! My “Proud Peacock” pendant features the same gorgeous glass and comes with a faux black leather cord at no additional charge. 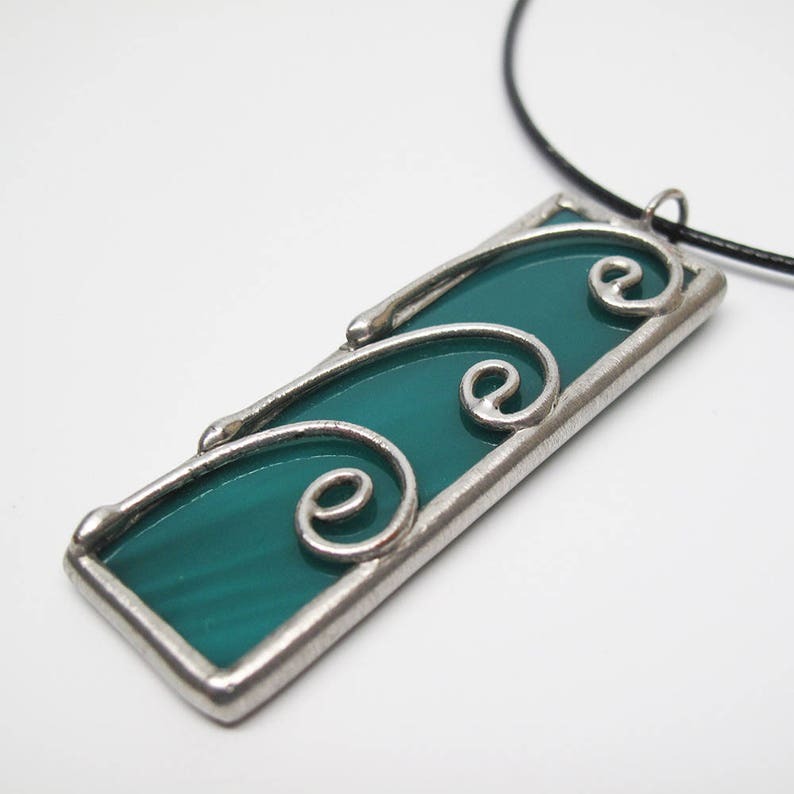 An opaque, teal green stained glass pendant edged in silver, accented with silver wire spirals. A free 16"-18" adjustable soft black leather cord with clasp is available at no additional cost. Actual Size: 2 9/16" x 3/4"
Each item by Faerie Glass Is 100% uniquely hand-crafted with quality materials that are lead-free. NOTE - All photographs are taken in effort to best represent the actual product. Color of actual jewelry may vary slightly from photographs. Gorgeous! Very well made. Beautifully wrapped. Thank you! Beautiful necklace! Great size, will really stand out. Can’t wait to wear it!! I gladly accept Visa, MasterCard, American Express, Discover, or regular account payments all through PayPal or direct checkout. If an item arrives damaged, you may return it for repair (if possible) within 30 days, or for a refund of the purchase price minus the shipping expense. All items are shipped via USPS mail. On average, if shipped within the United States, your package will arrive within 3-5 business days once shipped. International orders may take longer. Each item is securely packaged for safe delivery.